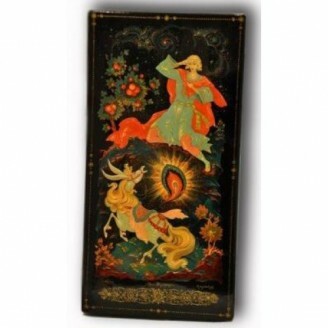 Russian Treasure proudly presents an exclusive one-of-a-kind masterpiece, a unique Palekh lacquer box, made in the times of USSR by a famous Russian artist A. Drozdov. 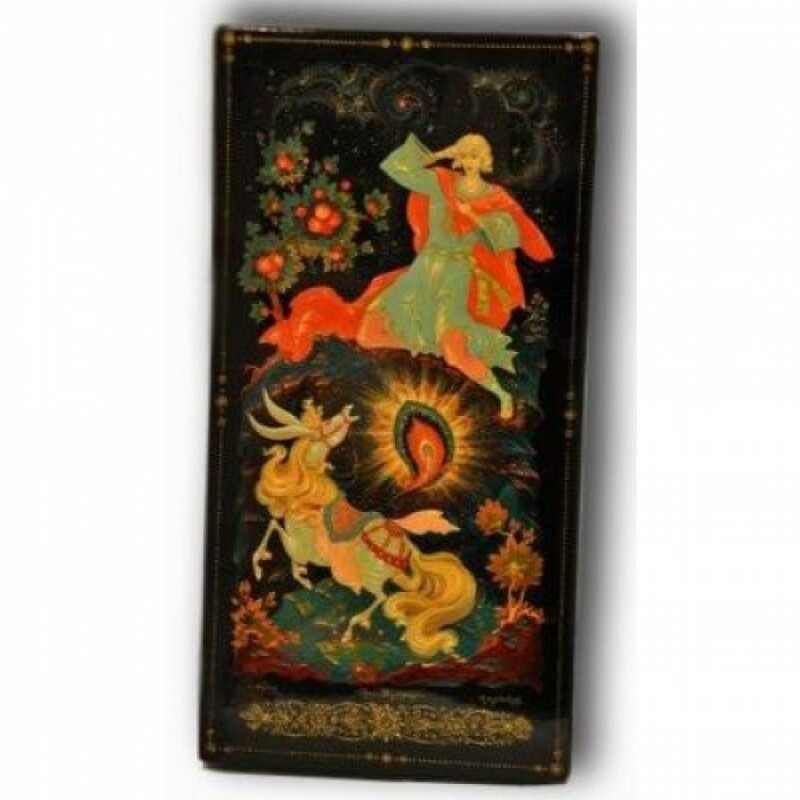 Hand crafted according to the strict antique canons of Russian lacquer miniature painting, this Palekh box features one of the most favorite fairy-tales – the Tale of the Firebird and the Humpbacked Pony. The episode impressed on this Palekh lacquer box tells about Ivan, the youngest son always deemed a fool by others, who found the magic feather of the Firebird and kept it, despite his humpbacked pony's warning not to touch it. The artist has chosen the traditional black background to emphasize the shining gold of the Firebird’s feather – a distinctive feature of most Palekh lacquer boxes. The general color palette is based on smooth yellow, red hues with some touches of pastel shades. The multiple color layers applied on this Palekh lacquer box add vibrancy to the golden and silver tones of the composition, while the artful filigree designs cover the edges of the lid and the sides of this Palekh lacquer box. The viewer is enchanted by the skillful representation of the hero’s facial features – which is an art in itself. And a most important part – the lacquer finish of the Palekh box. Every Palekh lacquer box is covered with several layers of varnish – the process that can take up to several months. But the achieved result will not wear out for generations, and the Palekh lacquer box will gratify one’s eyes of many years ahead. This Palekh lacquer box is hinged on the side and can boast a blazing red lacquer interior. Signed by the author, the place of manufacture – the village of Palekh, the back side of this lacquer box also states the country where it was produced, the USSR. A truly unique and antique gift for a fervent collector, this Palekh lacquer box will also appeal to a person who simply enjoys beautiful and extraordinary things.